NEW ORLEANS – The collegiate track & field season is officially in the books, capped by a spectacular week at the NCAA Championships in Eugene, Oregon. But the battle for the sport’s highest individual honor – The Bowerman Award – has only just begun. Ten women were announced Wednesday by the Bowerman Advisory Board as Semifinalists for the iconic 35-pound trophy named after legendary Oregon coach Bill Bowerman. Men’s Semifinalists will be announced Thursday. Three Finalists will be selected from among these 10 by the Advisory Board and announced next Thursday, June 23. Courtney Frerichs SR New Mexico Distance Nixa, Mo. Shamier Little JR Texas A&M Hurdles Chicago, Ill.
Maggie Malone SR Texas A&M Throws Geneva, Neb. Keturah Orji SO Georgia Jumps Mount Olive, N.J.
DeAnna Price SR Southern Illinois Throws Moscow Mills, Mo. Raven Saunders SO Mississippi Throws Charleston, S.C.
Ariana Washington RS FR Oregon Sprints Signal Hill, Calif.
Kendell Williams JR Georgia Combined Events Marietta, Ga. Returning as Semifinalists from a year ago were Shamier Little of Texas A&M and Keturah Orji of Georgia, along with 2014 Semifinalists Kendell Williams of Georgia and Courtney Okolo of Texas. Okolo would go on to become a Finalist in 2014. First-time Semifinalists included Courtney Frerichs (New Mexico), Maggie Malone (Texas A&M), DeAnna Price (Southern Illinois), Raven Saunders (Mississippi), Dominique Scott-Efurd (Arkansas), and Ariana Washington (Oregon). Both Texas A&M and Georgia put forward two Semifinalists apiece, marking the second year in a row two schools have been represented by pairs. Texas A&M did so for the second consecutive year, joining Oregon (2011, 2012) as the only schools to accomplish that feat. Georgia became the fourth program with two or more Semifinalists in the same season, alongside Texas A&M, Oregon and Kentucky. Frerichs toppled the steeplechase collegiate record formerly held by a Bowerman winner – Jenny Barringer of Colorado in 2009 – with a blistering 9:24.41 to win the NCAA title by more than 16 second. That win gave her two sub-9:30 performances this season, a feat previously accomplished only by Barringer. She is the first Bowerman Semifinalist from New Mexico. Little won her third consecutive NCAA title in the 400-meter hurdles (remember, though, that only accomplishments from this current season count for Bowerman consideration) in 53.51 for the second-fastest time in collegiate history. She emerged victorious by 1.16 seconds in a race that had more women run faster than 55 seconds – five – than in any other previous NCAA final. Malone surpassed a 13-year-old record in the javelin when she unloaded a heave of 62.19m to win the NCAA Championships title, besting the mark of 61.82m (202-10) set by Indiana’s Irina Kharum in 2003. With that fifth-round throw, she became the first woman in collegiate history to twice throw farther than 200 feet in the same competition after heaving it 61.55m (201-11) on her first throw. All told, she ended the season with five of the 10 best throws in college history, four of which came at NCAAs. Thanks to Little and Malone the Aggies have now had eight Semifinalists, the second most of any women’s program. Okolo dominated the NCAA Championships 400 meters title with a 50.36 for the 10th-fastest time in collegiate history. She came back later that day to rally the Longhorns 4×400 relay to a national title as she overtook two teams on the final straightaway. Her NCAA Championships accomplishments came after she broke the collegiate record earlier this season with a 49.71 run – the first sub-50 clocking in collegiate history. Okolo, along with Williams, became just the second and third women in Bowerman history to be named Semifinalists in non-consecutive seasons, joining Colorado’s Emma Coburn (2011, 2013). Orji not only twice broke the collegiate triple jump record this season, but she also topped the American Record in the event. At the NCAA Championships, she leaped 14.53m (47-8) for the all-time college and U.S. records, besting her own college record of 14.29m (46-10¾) set two weeks prior at the NCAA East Prelims. All 11 of her measured attempts this season surpassed the No. 2 collegian, and she surpassed 14 meters with a legal wind six times – no other collegian has done that more than four times in an NCAA career. Price broke her own NCAA Championships record in the hammer throw with a winning 71.53m (234-8) heave in Eugene, topping the second-place finisher by nearly six meters for the biggest win in meet history. She threw 72.66m (238-4) during the regular season for the No. 2 throw in college history, and tallied the 12 farthest throws of the 2016 college season. Saunders became the first college woman ever to surpass 19 meters in the shot put during the outdoor season, eclipsing Meg Ritchie’s 33-year-old NCAA record of 18.99m (62-3¾) with an NCAA title-winning heave of 19.33m (63-5). The sophomore now owns the collegiate outdoor and indoor records after she went for 19.23m (63-1¼) during the winter. She is the first Semifinalist from Mississippi. Scott-Efurd won the NCAA titles at both 5000 and 10,000 meters this past weekend, a feat no woman has accomplished since former Bowerman Finalist Lisa Koll of Iowa State in 2010. She took the 5000 title in 15:57.07 after claiming the 10,000 crown two days earlier in 32:25.69. She ran the seventh-fastest time in college history at 10,000 meters earlier this year with a 31:56.84 at the Payton Jordan Cardinal Invitational. She is Arkansas’ third Semifinalist. Washington became the first woman in 13 years to sweep the 100- and 200-meter NCAA titles, and the first freshman ever to do it. She claimed the 200-meter national title in 22.21 for the fourth-fastest time in collegiate history, and she took the 100 title in a wind-aided 10.95w (+2.6m/s).She also ran a leg of the third-place 4×100 relay. During the regular season, she finished runner-up in the Pac-12 100 meters final and third at 200 meters. 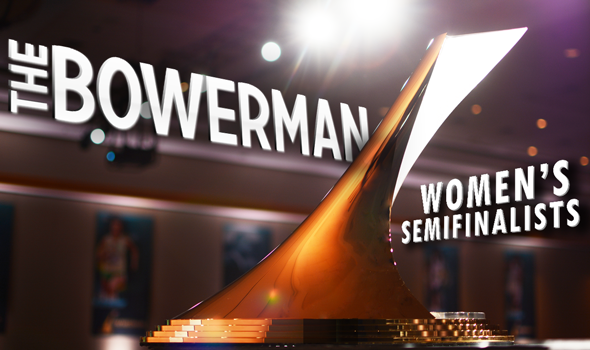 Hers is the 11th Semifinalist appearance of Oregon’s for the women’s award, the most of any school in the country. A redshirt freshman outdoors, Washington became just the fourth freshman member of the Semifinalist pool in the award’s history. She joins Ashley Spencer of Illinois (2012), and Georgia’s Kendell Williams (2014) and Keturah Orji (2015). Williams won the NCAA title in the heptathlon with a come-from-behind victory over defending national champion Akela Jones of Kansas State. She scored a career-best 6,225 points to move to No. 7 on the all-time collegiate list. At the SEC Championships earlier this season she finished runner-up in the 100-meter hurdles final.